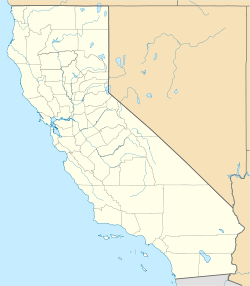 Moores Flat (variant: Moore's Flat; formerly, Clinton) is a former settlement in Nevada County, California. It is situated at an elevation of 4,144 ft (1,263 m) above sea level. Moores Flat is located 4.25 miles (6.8 km) north-northeast of North Bloomfield. Moores Flat was settled between 1851 and 1852 as a gold rush site with "Marks & Co." one of its few known gold dust dealers. Gold was found buried in tertiary gravel channels. In 1880, the population was 50. By the early 1900s, the population of the town declined quickly. The Clinton post office opened in 1854; the name was changed to Moores Flat in 1857. It closed for a time in 1903, and then closed for good in 1910. The miner and California State Assemblyman, S. L. Blackwell, was associated with the town's post office in 1880. The name honors H.M. Moore who built the first house and a store there in 1851. ^ a b c d e Durham, David L. (1998). California's Geographic Names: A Gazetteer of Historic and Modern Names of the State. Clovis, Calif.: Word Dancer Press. p. 525. ISBN 1-884995-14-4. ^ a b "About Alleghany". holabird.com. Retrieved 2010-04-03. ^ "Nevada County GenWeb Nevada County History". cagenweb.com. Retrieved 2009-05-31. ^ "Grass Valley". origsix.com. Retrieved 2010-04-03. ^ Harvard University. Museum of Comparative Zoology (1880). Memoirs of the Museum of Comparative Zool̈ogy at Harvard College (Public domain ed.). University Press. pp. 403–. This page was last edited on 23 May 2018, at 14:46 (UTC).